The 72 in. Tinsel Nutcracker from Home Accents Holiday offers a fun and festive way to greet your holiday guests. Suitable for indoor or outdoor use, this colorful guy is pre-lit with 200 mini lights for easy nighttime visibility and can be placed on your lawn, inside a window, by your front door or any place that could use a bit of nutcracker magic. Made with a sturdy metal frame and durable, weather-resistant tinsel fabric, this charming fellow is easy to assemble and ready to stand guard season after season. The 65 in. 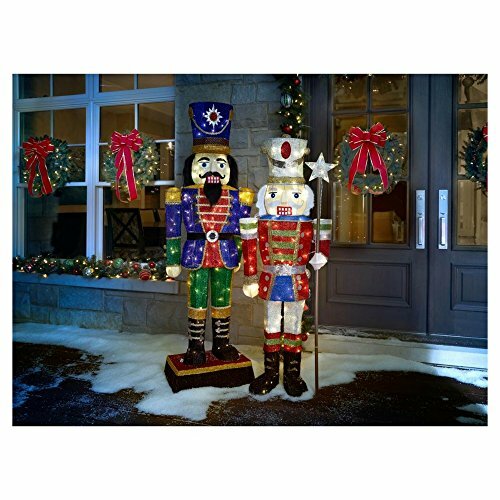 Tinsel Nutcracker Soldier from Home Accents Holiday offers a fun and festive way to greet your holiday guests. Suitable for indoor or outdoor use, this colorful guy is pre-lit with 200 mini lights for easy nighttime visibility and can be placed on your lawn, inside a window, by your front door or any place that could use a bit of nutcracker magic. Made with a sturdy metal frame and durable, weather-resistant tinsel fabric, this charming fellow is easy to assemble and ready to stand guard season after season.